The Trump administration failed to show that the country was in grave danger unless the Executive Order was allowed to go into effect immediately. What does President Trump's executive order do? It suspends for 90 days the entry of non-citizens from seven countries; suspends for 120 days the United States Refugee Admissions Program; and suspends indefinitely the entry of all Syrian refugees. Do the states (Washington and Minnesota) have a right to challenge the executive order? YES. The states have "standing" because non-citizens who live and work in those states will be seriously harmed by the executive order, and so will educational, business, and other institutions in those states that rely on those non-citizens. Does the President have the power to issue such an executive order? YES. On matters of immigration and national security, the President has wide-ranging authority, and the judicial branch should almost always defer to presidential judgments in these matters. But is the President's executive order entirely immune from judicial review? NO. To quote from the decision, the "fundamental structure of our constitutional democracy" provides for a judicial check on the other branches of government to insure that they do not violate the Constitution, and executive orders such as this one are no exception. What did the trial judge do in this case? The trial judge, Federal District Court Judge James Robart (appointed by President George W. Bush) issued a temporary restraining order (TRO)--i.e., a temporary suspension of the enforcement of the executive order--until there is a full hearing to determine whether the executive order is constitutional. What specifically had to be decided when the Trump administration appealed from that TRO? The Federal Court of Appeals for the 9th Circuit had to decide whether to overturn that temporary restraining order (TRO), not whether the executive order is ultimately constitutional or unconstitutional. What determines whether the TRO should be overturned on appeal as sought by the Trump administration? That depends on the answer to 2 questions: 1) whether the Trump administration can show that it will probably win after a full hearing on the constitutional merits of the executive order, and 2) whether it can show that the country is in grave danger because of the TRO (i.e., if the executive order is not in effect). What did the 9th Circuit decide on those 2 questions? The 9th Circuit held that 1) the Trump administration failed to demonstrate that it would probably win the case on the constitutional merits (i.e., the court found that the states' due process and non-establishment of religion claims are substantial), and 2) the Trump administration failed to demonstrate that the TRO placed the country in grave danger of a terrorist attack. What precisely was the 9th Circuit's order? In a unanimous 29 page per curiam (for the court) opinion, a 3-Judge panel of the 9th Circuit denied the Trump administration's "emergency motion" to undo the TRO. Who were the 9th Circuit Judges who unanimously decided this appeal? 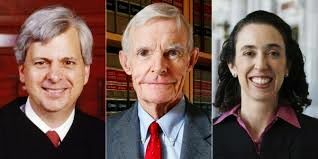 The 3 judges who decided this appeal are: William Canby (appointed by President Carter), Richard Clifton (by George W. Bush), and Michelle Friedland (by Obama). What happens next? There are several possibilities. The Trump administration could ask the entire 9th Circuit (en banc) to hear this appeal; the administration could ask the Supreme Court for an emergency ruling to overturn the TRO [That would go to Justice Kennedy who would almost certainly ask the entire Supreme Court to make that decision. ]; or the administration could simply return to the district court judge who originally issued the TRO for a full-blown hearing on the constitutional validity of the executive order.